Congrats to kaki Stronot for bagging a seat in this evening's LWPS Satellite! Quick question, how do I register myself for the LWPS ME on July 23? All you need to do is call the NCTours hotline @ +65 6214 2822 to reserve your ferry ticket and cabin. 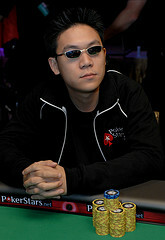 We'll verify your ID with the identity information that Pokerstars submits to us, and we'll buy-in you in on the spot. eh ikelos, why the $11 satellites keep cancelling nowdays? Am sure u guys have been wondering what has been going on with the online satellites. Pls bear with us as the satellites are now restricted to Singapore and Malaysian players only. We are in the process of re-structuring the schedule and details will be posted in the coming few days. As Ivan has described earlier, all our satellites are now restricted to Singapore and Malaysian based accounts. 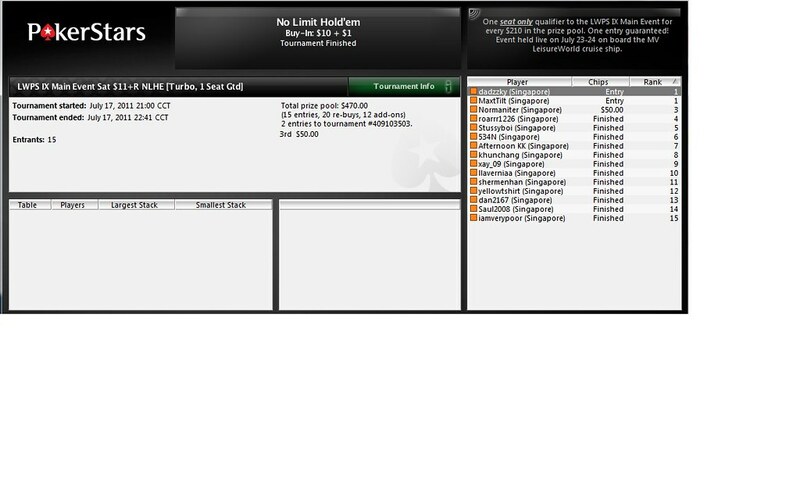 You've all probably wondered why there were so many players from other countries previously, and the reason was because they thought they could unregister for the main event and keep the T$. When they discovered they couldn't, Pokerstars naturally got a lot of complaints from these guys. Hence, Stars has decided to restrict all LWPS satellites to SG and MY for the time being. - The $11+R will now require 8 instead of 10 players to start. The 1 Seat Guarantee remains. - The $1.10 3X Turbo will be changed to a $2.20 3X Turbo. Going forward, there will also be a 1 Seat Guarantee for this satellite. Congrats to kaki dadzzky and MaxTilt for winning the LWPS IX ME Seats.